Single and pregnant - who to invite to the birth? You are a little scared of childbirth and labor. You want someone near and dear with you during these important moments, and not just to be surrounded by healthcare providers. You want an advocate to stand up for your rights as a patient. You want distraction from the pain or contractions. You want to share these most sacred feelings with someone else, especially in the absence of a partner. You want somebody to stay with the baby after birth if you have a cesarean section or some kind of other medical emergency. Your choice of birth partner will obviously depend on the reasons you have for wanting company. 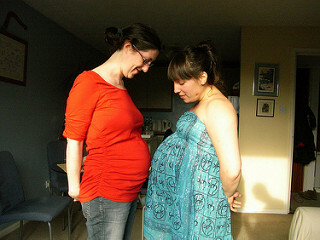 Open communication with your friend or relative is the best road to finding a great birth partner. Some people get all upset and scared at even the thought of blood and needles, and those are obviously not a great choice for a labor coach! Also keep in mind that, perhaps, you will feel a little uncomfortable in the presence of your mother while pushing a baby out. And whoever attends your birth will see you in a vulnerable position. Deciding who to invite to the birth of your baby is quite a big choice. When you've made the right one, you'll know it! Would you allow your older children to watch a new sibling's birth? How often do you cross train?